Episode 7: Is Atheism a Religion? Episode 7 of Unorthodoxy with Witch Zaftig asks: Is Atheism a Religion? First, we discuss how atheism is defined, then examine how various groups and individuals with competing interests have amplified that definition. One example provided is by Sam Harris, of the so-called “new atheist” movement, who advocates for a particular kind of atheistic “spirituality” in his book Waking Up: A Guide to Spirituality without Religion. 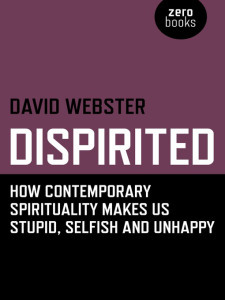 To refute this obfuscation of the words “atheism” and “spirituality” is scholar of religion David Webster in his book, Dispirited: How Contemporary Spirituality Makes Us Stupid, Selfish, and Unhappy. Webster argues that “spirituality” is a superficial and meaningless concept that modern society has adapted as a response to institutionalised religion, reflective of our current anti-religious sentiment in the western world. Webster claims that this all-too-broad and new-age concept is actually toxic, and no better or worse than fundamentalist religion.